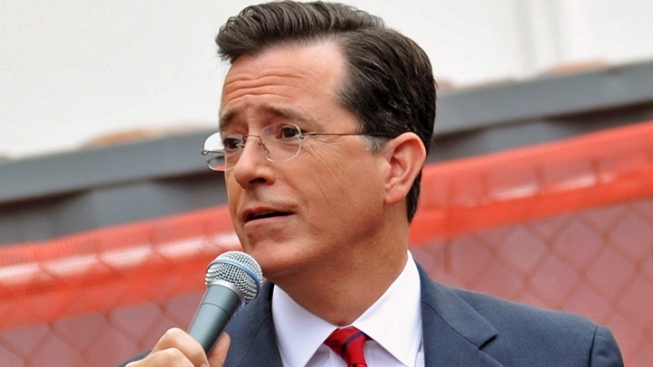 Stephen Colbert IDs New Threat: "Stoned Pat Robertson"
"We must stop Pat before The 700 Club becomes The 420 Club." Stephen Colbert has identified a new national menace—and this time it isn't bears. Two weeks ago, cannabis enthusiasts got an unlikely new ally in the crusade for marijuana legalization: famed televangelist Pat Robertson, a Christian Right mainstay otherwise known for his decidedly non-progressive stances on feminism, homosexuality, abortion, and the Muslim faith. "It's time we stop locking up people for possession of marijuana," the 81-year-old broadcaster said on the Mar. 1 edition of "The 700 Club." On Tuesday night, Stephen Colbert devoted one-third of his recurring "ThreatDown" segment to the ominous threat posed by a "stoned Pat Robertson." "We must stop Pat before 'The 700 Club' becomes 'The 420 Club,'" Colbert said, alluding to significant numerals in cannabis subculture. "Jesus said he would make you a fisher of men—not a Phish fan of men," he joked. Watch the full clip below and share your thoughts in the comments section.